It has an Anti-Spill System that operates thanks to an inner buoy that prevents the overflowing of water when the capacity of the water tank goes beyond the proper level. Thus, the water will not be spilled out of the bottle or the machine in case the bottle has tiny holes. All the tubes in contact with water are made of STAINLESS STEEL. Compartment at the bottom part that can be used to store other products, such as food or drinks. Safety tap for hot water that prevents accidental scalds. 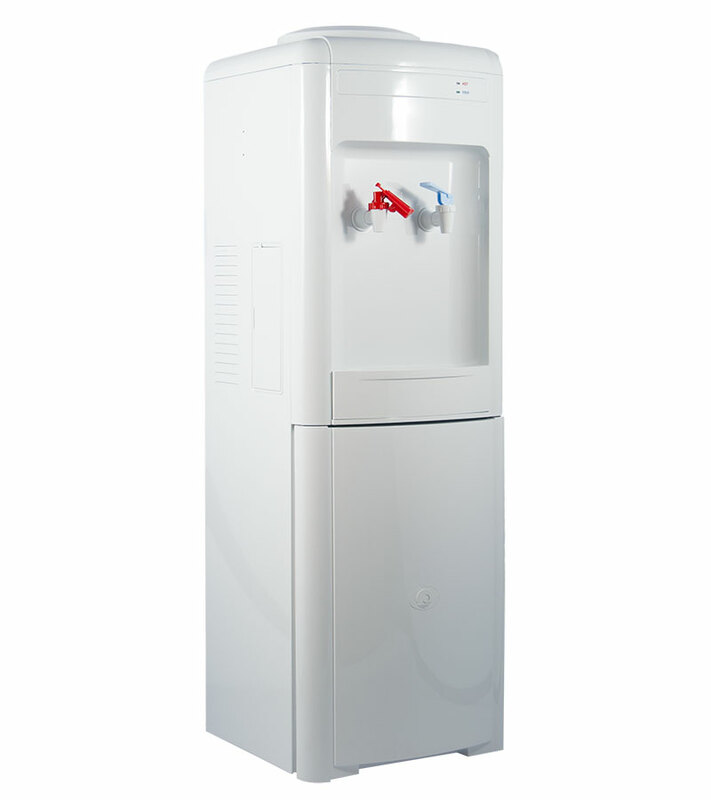 White water dispenser with a Refrigerator Compartment at the bottom part, which can be used to store other products, such as food or drinks. It has a modest design that allows total versatility regarding its location, either at home or in companies. Like with all our water fountains, our model LE PLEIN has also been improved with a more powerful compressor, as it is necessary to cool and heat water as well as refrigerate the lower compartment. This compressor works in a more efficient way, with much more performance, it reduces energy consumption and, mainly, it is much more silent. Moreover, it has an Anti-Spill System that operates thanks to an inner buoy that prevents the overflowing of water when the capacity of the water tank goes beyond the proper level. Thus, the water will not be spilled out of the bottle or the machine in case the bottle has tiny holes. Also, all the tubes in contact with the water are made of STAINLESS STEEL, which guarantees healthiness, hygiene and a lack of plastic taste in the water as it happens with the other machines of the market. The Water Fountain le Plein cools and heats water and it has a water collector, a thermostat to adjust the water temperature on demand and a safety tap for hot water in order to prevent accidental scalds. You can also deactivate hot water if you wish to have room temperature water, and as a final result, a cold and room temperature water dispenser. This dispenser is compatible with all our PET bottles in their different formats, and you can add some accessories to it such us our new transparent Glass Holder, and it matches perfectly with our metallic Shelf or white bottle holder for 4 PET bottles.